This week marks the six-month anniversary of Hurricane Maria. The Category 5 hurricane was the worst to hit the island in nearly a century. It left thousands of people stranded, some without homes, others without power or clean water. While much has been done on the island to repair damage and infrastructure, the road to full recovery is long and, six months later, there is fear that the world may be forgetting about Puerto Rico. Documentary filmmaker Michael Thomas released a short video from a recent trip to Puerto Rico. In it he identifies some of the issues that are still plaguing the island after Hurricane Maria and challenges us: #DontForgetPuertoRico. Keep reading to learn more about what you can do to help today. Today, it is estimated that 11% of the population is still without power. Many people are without reliable access to clean water. And, for others, damage to buildings and communications infrastructure during the storm has made it difficult to find and keep work. Some estimates suggest that in the wake of Hurricane Maria the poverty rate in Puerto Rico has increased from 44% to 52%, and may reach as high as 59% this year. Following a disaster, we all feel the urge to give. We see heartbreaking photos and news coverage of damaged homes and unthinkable destruction and want to do something. This giving is important, but we must also remember that the road to full recovery is a long one that often takes many months, if not years. It is clear that Puerto Rico still needs our help. 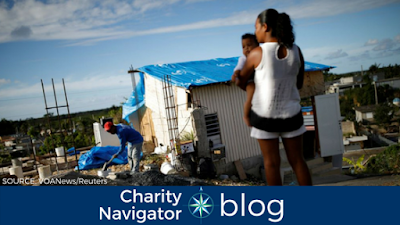 You can use Charity Navigator’s Hurricane Maria Hot Topic to find a highly-rated organization providing relief and support on the island. Consider making a gift today and challenging your friends to do the same by using the hashtags #DontForgetPR or #DontForgetPuertoRico on Twitter and Facebook.